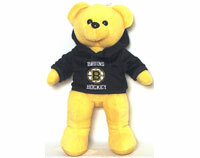 Adorable soft yellow Boston Bruins bear with black hoodie sweatshirt. Measures about 14" tall. Black hoodie with Boston Bruins logo on front.